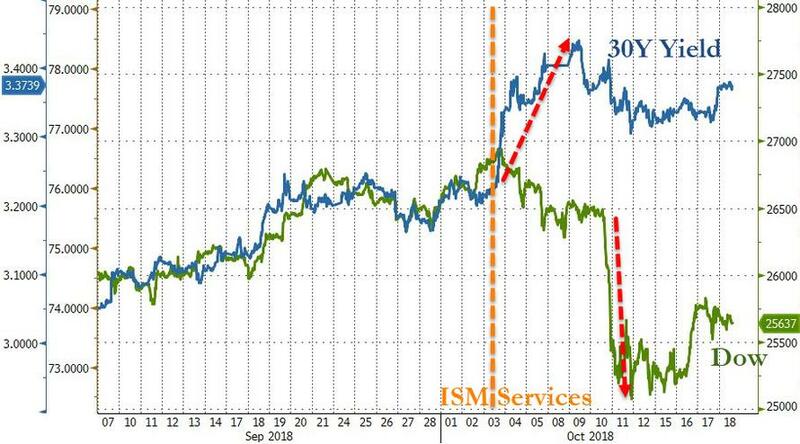 Breslow: "This Is The First Actually Data-Dependent Fed... 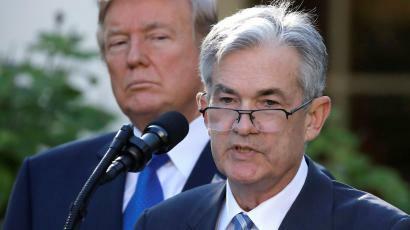 Embrace It"
Equity traders and investors are becoming increasingly uncomfortable that Jay Powell "knows nothing" about his role as ponzi-plunge-protector of the wealthy-getting-wealthier market, no matter what. Instead he seems more interested - as he plainly expressed in the long ago past, and last week - with inflation and jobs mandates achieved, financial stability is key (i.e. don't let the bubble get out of hand). Sadly, it is far too late to let the air out of this 'everything bubble' in anything but an explosive manner, and yesterday's FOMC Minutes confirm Powell's rate trajectory. And as former fund manager and FX trader Richard Breslow notes, the reaction to the Fed minutes was telling. For reasons that utterly escape me, there seemed to be some subconscious expectation that notes from a policy-setting meeting held on September 26 would take into account equity-price action that took place in October. For markets that continuously question Fed forecasts, that’s putting a lot of faith in their prescience. There has been plenty of commentary that described the minutes as stale given subsequent events. In reality, the minutes describe a world view that most likely hasn’t changed a bit from a rates perspective from those heady days when stocks were lingering near the highs. And for those handicapping expectations, they were quite faithful to what Chairman Jerome Powell has been saying rather plainly. Traders seem to be unduly traumatized by recent equity weakness. The Fed is motivated by actual economic numbers that allow them to pursue the imperative of continuing to normalize rates. It was refreshing that the minutes didn’t feature an overly tortured debate on exactly where the neutral rate lies. It is an example of pragmatism over theory. Much better that they acknowledged leveraged loans, tariffs and emerging market strains. Those are things that actually affect people’s lives. I think the notion of raising rates above neutral is a brilliant tour de force. I doubt they want to meaningfully do it, but it certainly stops the ceaseless speculation about when this hiking cycle will end. This is your first actually data-dependent Fed. Embrace it. Equity traders aren’t yet on the same page with a Fed that is making a valiant effort to focus on the real economy rather than merely financial markets. Old habits are hard to break. Global equities began their latest wobble, not when the Fed raised rates, but, ironically, after the U.S. ISM non-manufacturing knocked the cover off the ball a week later and Treasury yields took the next step higher. The discomfort of many investors may be directed at the Fed’s stated plans, but that is a secondary derivative. Chinese economic strength is a big open question. Europe’s growth trajectory has flattened. The seamlessness of the global supply chain is in doubt. All things that the Fed has to take into consideration. But none of which is under its control. Those who long for the days of global central bank coordination forget what brought that about. 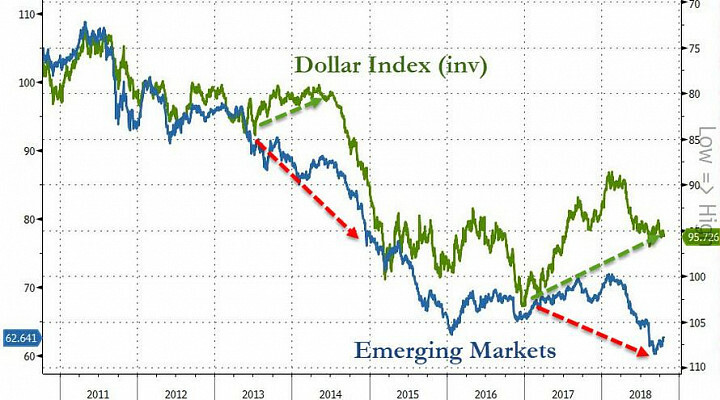 The dollar certainly hasn’t run higher. Treasury yields are up but are nowhere by historical standards. Yet these two assets are constantly blamed for emerging market stress. The Fed can read a chart as easily as anyone else and, the load of dollar denominated leverage notwithstanding, surely realizes that it is global growth that ultimately is the arbiter of how this sector fares. It is impossible to argue that anything the FOMC has done has contributed to the IMF’s downgrade of global GDP forecasts. If anything, the gradual approach is a way of being kind to the rest of the world. We’ve gotten into a dangerous, if totally understandable, reliance on central banks as the only functioning governmental institutions. In that vein, markets may indeed be right. And that, rather than current U.S. economic performance may explain why there remains a hesitancy to fully embrace the dots.